Ancient Brno's monastery by M.Pardy. Image licensed under Creative Commons Attribution-NoDerivs 2.0 Generic license. 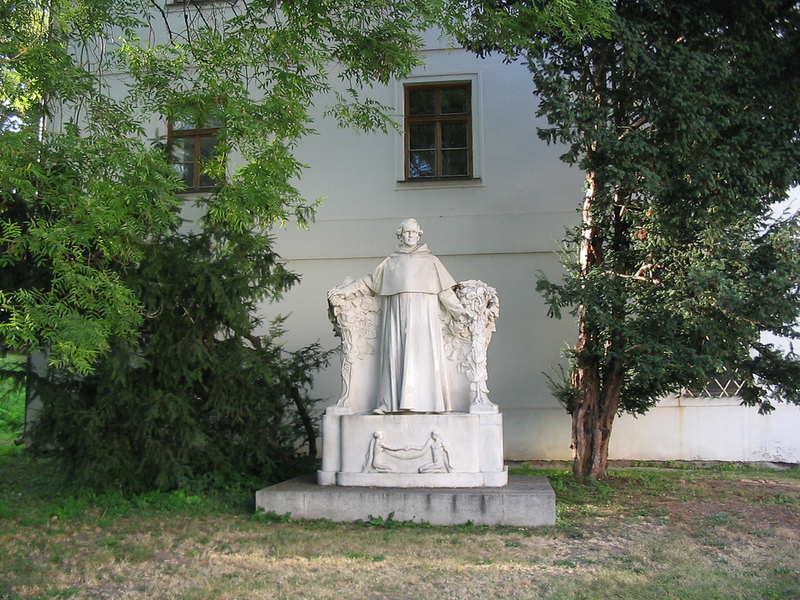 Brno, the capital of Moravia, is a commercial city, containing the Augustinian monastery where Gregor Mendel discovered the laws of inheritance named after him. Part of the monastery is now a museum in his memory, called the Mendelianum. A patch of garden in front of the entrance is said to be Mendel’s actual experimental plot, where he did the thousands of hybridization experiments that were the basis for his results. The number “2” is the magic number here. The statistics of Mendel’s results are the same as the statistics of tossing two coins simultaneously, and it made good sense to Mendel, for there are two sexes, allowing each metaphorical coin to be derived from one parent. It makes sense in modern terms, too, for chromosomes (not yet discovered in Mendel’s day) are generally paired. These basic principles emerge clearly from a visit to the museum, presented by means of detailed posters. Flowers planted in Mendel’s garden patch are also intended to help, but they are merely floral representations of numbers (three red and one white in the second generation, for example), unrelated to anything to do with hybridization. They may even cause confusion by obscuring the statistical nature of actual hybridization experiments. The former refectory of the monastery now contains a sequence of showcases and posters to display the facts of Mendel’s life, education, and work, and they go on from there to a few highlights of modem genetics, such as the discovery of chromosomes and the role of DNA. Another room (a former chapter hall) is now a conference room, with contemporary furniture and a fine portrait of monk Gregor. There is also a good photograph of Mendel with some of his monastic colleagues, which shows them as anything but unworldly monks-it’s more like the annual group picture of a present-day departmental faculty. The Academy of Natural Sciences of Drexel University today, by youcanlookiyup. Image licensed via Creative Commons Attribution-ShareAlike 3.0 Unported license. This article is condensed and reproduced by permission of the ANSP from www.ansp.org. The Academy of Natural Sciences of Philadelphia (now the Academy of Natural Sciences of Drexel University) was founded in 1812 “for the encouragement and cultivation of the sciences, and the advancement of useful learning.” The unique aspect of this statement of purpose lies in the word “useful,” a mandate the Academy has continuously redefined through research and education that reflects the societal needs of the times. The Academy’s history mirrors the evolution of the relationship between the American people and the natural world. The oldest natural sciences institution in the Western Hemisphere, the Academy was founded when the United States hugged the Atlantic coastline, and Philadelphia was the cultural, commercial, and scientific centre of the new nation. Classic expeditions to explore the western wilderness, such as those led by Stephen Long and Ferdinand Hayden, were closely associated with the Academy. These explorers brought back new species of plants and animals, which were studied and catalogued; they formed the foundation of the Academy’s scientific collections which now contain over seventeen million specimens. The Academy opened its doors to the public in 1828. Here, the mysteries of nature were revealed, its chaos organized and labelled in Latin and Greek. The collections expanded so rapidly-through gifts, purchases, and exchanges as well as expeditions—that the Academy outgrew its building three times in sixty years. In 1876, its present home was built at 19th and Benjamin Franklin Parkway—then the outskirts of town, and now the heart of Philadelphia’s cultural district. With the opening of the new building, the Academy became a modern museum with areas for exhibitions and public lectures. By the end of the nineteenth and beginning of the twentieth century, Academy expeditions were ranging farther afield, to the Arctic, to Central America, and later to Africa and Asia. Plants and animals collected during these excursions were incorporated into the Academy’s magnificent dioramas, many of which were constructed in the 1920s and ’30s. To capitalize on the educational potential of the dioramas, the Academy initiated classes for students in the School District of Philadelphia in 1932. In 1948, long before water pollution and environmental degradation became topics of public concern, the Academy established the Environmental Research Division. This marked the beginning of a broadened research orientation for the Academy, which included applied research in aquatic ecosystems as well as the traditional systematics research–discovering and cataloguing organisms. Among the Academy’s most famous early members were Thomas Say, the father of American entomology and conchology, Alexander Wilson, the father of American ornithology, and William Bartram, one of America’s earliest botanists. Another distinguished early member was Thomas Jefferson, celebrated for his political career, but less well known as a scientist. Jefferson was in fact a central player in the beginnings of American palaeontology, at a time when people were struggling with the ideas of fossils as evidence of past life, of extinction, and of an Earth far older than the Biblical account. Some of the fruits of Jefferson’s palaeontology became part of the collections at the American Philosophical Society in Philadelphia. Beginning in 1849 these holdings were transferred to the Academy of Natural Sciences of Philadelphia, where they are currently housed. This is the Thomas Jefferson Fossil Collection. Another important historical collection with Jeffersonian associations that is cared for by the Academy is the Lewis and Clark herbarium, made up of several hundred of the plants collected by the two explorers on their epic cross-country journey of 1804-1806. A close-up of a Golden Eagle from Audubon's Birds of America, by John James Audubon (1785–1851). Image in public domain and available via Wikimedia Commons. One of the Academy’s most prized holdings is an original subscription copy of John James Audubon’s famous book The Birds of America. Published from 1827–1838, this monumental work is arguably the most influential book on birds ever created. It contains 435 life-sized hand-colored engravings bound into five volumes. Less than half of the 200 original sets of the “double elephant folio” survive, of which this is one. To celebrate this magnificent book – and Audubon’s association with the Academy, where he was elected a corresponding member in 1831 – an ‘Audubon page turning’ ritual has emerged. At 3.15 every week day, a member of the library staff turns a page of The Birds of America, and museum visitors are invited to see the next picture and ask any questions they may have. Joseph Leidy (1823-1891), who helped to build the Academy’s palaeontology department in the nineteenth century and whose statue stands in front of the museum, gives perhaps the fullest sense of what science, and men of science, were like in America’s past. Leidy was an encyclopedist of the natural world and – in the words of his biographer Leonard Warren – “the last man who knew everything.” Unlike the narrow experts who now make up the scientific profession, Leidy was an amateur polymath of nature; his knowledge spread (and was solicited) far and wide. He was known as the “Father of American Vertebrate Paleontology”, but besides this he was also a pioneering anatomist, parasitologist, protozoologist and natural historian. An enthusiastic supporter of Charles Darwin’s theory of evolution, it was Leidy who saw to it that Darwin was elected to corresponding membership in the Academy in 1860 – the first American institution to so honour him following his publication of On the Origin of Species. Today, the Academy is a world leader in biodiversity and environmental research, a focus that is reflected in its research, its education and its outreach work. Its permanent exhibits of contemporary science include butterflies, dinosaurs, dioramas, and a live animal centre. And for those who are curious about the history of science, but cannot visit in person, the Academy’s website hosts some excellent interactive collections, including Audubon’s daily page turning, Leidy’s works, and Jefferson’s fossils. 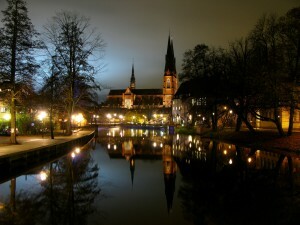 Uppsala by WixPix. Image licensed under Creative Commons Attribution-NoDerivs 2.0 Generic license. Linnaeus Garden. Linnaeus was appointed Professor of Medicine at the University of Uppsala in 1741, after some rather undignified infighting among several candidates for the position. Botany was academically a part of medicine at the time because plant extracts were the most common form of medication, and renovation of the university’s neglected botanical garden (originally founded in 1655) was one of the new professor’s assigned tasks. A house adjacent to the garden came with the appointment and served as Linnaeus’s residence. Classically proportioned, with a red brick facade, it now serves as the garden museum, laid out and furnished much as it must have been in Linnaeus’s day. The garden area itself has been beautifully restored-the layout is nearly the same as the original, modeled according to the prevailing style, with narrow parallel formal beds and three pools and an orangery at the back. Two symmetrical sections (parterres) contain beds for perennial and annual (or biennial) plants, respectively. Arrangement within the perennial parterre is strictly in the order of the Linnaeus classification, but there are 44 beds for the 24 classes, allowing more than one bed for some classes. The annual plants are also grouped together by class, but the order varies from year to year. The path between the two sections is bordered by showy ornamental plants, and the pools beyond have water plants. The orangery used to be divided into frigidarium, caldarium, and tepidarium, to provide for a range of indoor environments, but it is less elaborate aeus in Lapland costume, from a 1737 painting. The flower fastened to his tunic is the twin flower, Linnaea borealis, shown here in a separate photograph. It blooms only briefly, close to midsummer, so you may not see it in the garden when you visit. today. Parts of it now have non-botanical uses, such as choir practice for a local group. Two little shelters on top of high poles near the entrance used to house chained monkeys. Linnaeus was very fond of the monkeys and is reported as having been unashamedly grieved when one of his favourites died. Linnaeus died at his garden residence and was buried in Uppsala Cathedral. There is a monument with a medallion portrait in a chapel off the north aisle. The tomb slab itself is in the floor, a little closer to the main entrance. 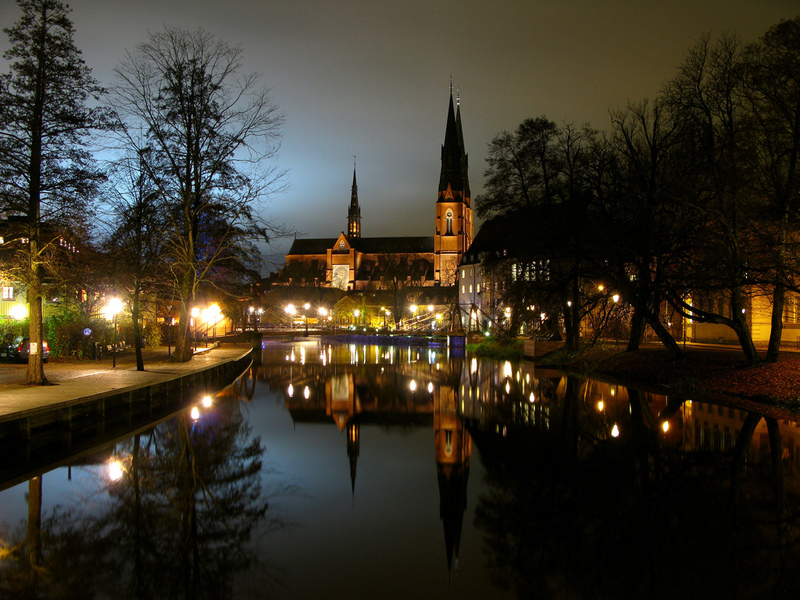 The cathedral is the largest church in Scandinavia and parts of it date back to the thirteenth century. In the outskirts of Uppsala we have Linnes Hammarby (6 miles [10 km] southeast), Linnaeus’s former summer residence, now a small state park. Linnaeus sometimes lectured here to students and large crowds of visitors. A little further out, toward the southwest, is Wiks Slott (Wik Castle), a fifteenth-century fortress with a fine park at the edge of a lake. Svante Arrhenius was born here in 1859, his father having been overseer of the estate at the same time as he was working for the university. (The university salary improved a year later, and the family was able to move into the city.) Gamla Uppsala (Old Uppsala), just north of the modem city, is also worth a visit. It was the royal capital of the Svea kingdom 1,500 years ago and contains burial mounds and other antiquities. A photograph of Wallace's birthplace, taken from My Life (1905). Image available in Public Domain. This is the place where Alfred Russel Wallace, co-founder of the theory of natural selection, was born on 8th January 1823. 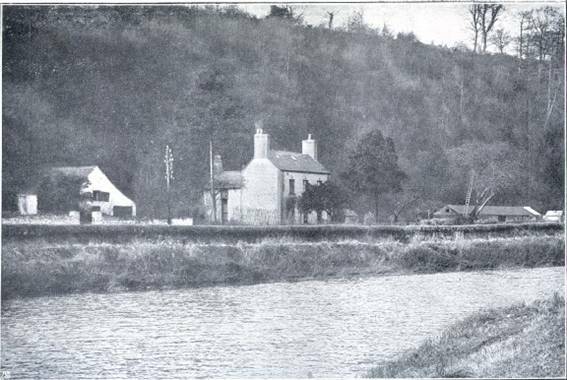 Originally, Monmouthshire was known as Gwent, Wales, but today is part of the twenty-two principal areas of Wales. The house still survives and is best known like Kensington House, although there have been some structural alterations and the houses which used to be to either side of it have been demolished. Nowadays there is no plaque in the house itself in order to remember how important is this place for the history of science. What we can found is a monument erected in 2006 by the Alfred Russel Wallace Memorial Fund, in the yard of Llanbadoc church, made from Carboniferous limestone with fossils on its surface and it has a black granite plaque, remembering Wallace. Unfortunately, the house is currently up for sale, and the last news about the possibility to officially protect Kensington House through the support of the Welsh Assembly Government and the National Trust are not very good, since on their consideration there is not a strong relation between the property and Wallace. As it’s mentioned here, Wallace devoted many passages on his autobiography to stressed the importance of this house and its surroundings. Hopefully, in the next years, especially through more research about Wallace and his contributions there can be a new possibility to protect Kensington House. A. R. Wallace’s birthplace up for sale! by George Beccaloni.